Saute the plums with the butter in a hot frying pan for a few minutes. Add the split vanilla pod, star anise, nutmeg, cinnamon, red wine, honey, sugar and water, then bring to the boil and simmer gently for 6 – 8 minutes. As the plums break down to a thick, syrupy texture, put them in an oven proof dish. To make the crumble, mix the butter and flour together until the mixture resemble breadcrumbs (best done in a food processor), then mix in the sugar. Sprinkle the crumble over the plums and bake in the oven for 20-25 minutes, or until golden brown. Remove from the oven and allow to cool slightly before serving with ice cream or custard. 1. Heat the double cream, vanilla pod and seeds and 100g/3½oz of the sugar in a saucepan until just boiling. Remove the pan from heat, add the soaked gelatine and buttermilk and whisk until well combined, then stir in the vodka. 2. Pour the mixture into dariole moulds, leave to cool, then chill in the fridge for at least two hours. 5. Mix the summer berries with caster sugar and the creme de cassis. 6. 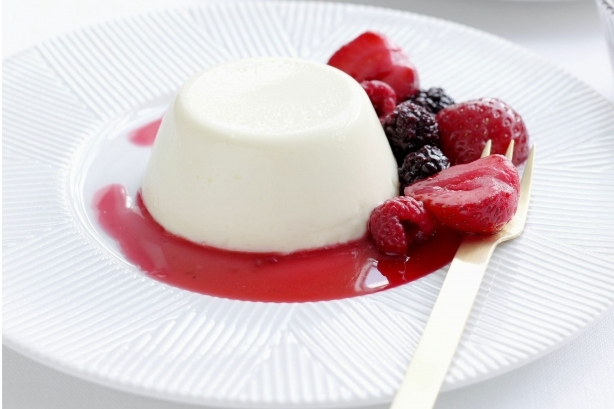 To serve, put the dariole moulds into a bowl of hot water for a few seconds to loosen the panna cottas, then turn out onto serving plates and garnish with the berries. This Sabayon is the basis for the Iced Coffee Parfait. It can also be used to make mousses and fruit gratins – taken from Raymond Blanc’s “Kitchen Secrets“. I have a Thermomix and used this to create the sabayon. I have included both methods below. Grind the sugar for up to 20 secs, speed 9. Insert the butterfly whisk and add the egg yolks. Cook at 50 degrees C for 4 minutes on speed 4. Add the wine and continue to cook at 80 degrees C for 5 minutes, speed 3. Remove the jug and plunge into a bowl of iced water for a minute or two. Dry off the jug and replace. Continue to whisk at speed 2 with no heat for another 5 minutes or until the sabayon has gone cold. In a large, heatproof bowl, whisk the egg yolks, caster sugar, wine and lemon juice together for 1 minute. Stand the bowl over a bain-marie of barely simmering water, making sure it is not touching the water and whisk for 7 – 8 minutes (I recommend using an electric whisk) until it reaches 78 degrees C, resulting in a light, fluffy sabayon. Remove the bowl from the heat and place over a larger bowl of crushed ice. Continue to whisk until the sabayon is cold. In another bowl, whip the cream to soft peaks and then fold into the cold sabayon. Cover and refrigerate until ready to use or freeze. This was the dessert presented at the Supper Club Night – A Taste of France, taken from Raymond Blanc’s “Kitchen Secrets” from which I have already tried a number of recipes successfully. A lovely dessert, but unfortunately, although the r ecipe states 10 – 12 servings, I found them to be rather meagre portions and would suggest that this dessert would better serve 8. I attach a photo* from the book which shows a decent thickness to the slice – those that I served my guests were rather thinner! To make the iced coffee Parfait: In a large bowl, gently fold the sabayon and coffee together. Fill a terrine with the sabayon, smooth the top and freeze overnight. To prepare the garnish: Preheat the oven to 180 degrees C. Mix the nuts with the icing sugar and alcohol of choice. Scatter on a baking tray and bake for about 7 minutes until lightly golden and crunchy. Allow to cool. To make the caramel sauce: Put 20ml of water in a small saucepan and add the sugar. Leave for a few minutes, then dissolve over a medium heat and cook to a dark golden brown caramel. Add the remaining 50ml water to stop the cooking. Mix in the diluted arrowroot to thicken the sauce and leave to cool. I must say, I struggled with this method of making caramel sauce, as the sugar kept crystallising, even though I had left it a few minutes before cooking (this is key). In the end I did it the only way I knew how, which was to dissolve equal parts of sugar and water together over heat (I used 150g of each) and then boil until the required caramelisation occurred. To serve: Dip the terrine into hot water for 4 – 5 seconds to loosen the parfait, then run a warmed knife around it and turn it out onto a board. Cut into slices with the warm knife. Drizzle the caramel sauce onto individual plates and place a slice of parfait in the middle. Scatter the caramelised nuts around the parfait and serve.